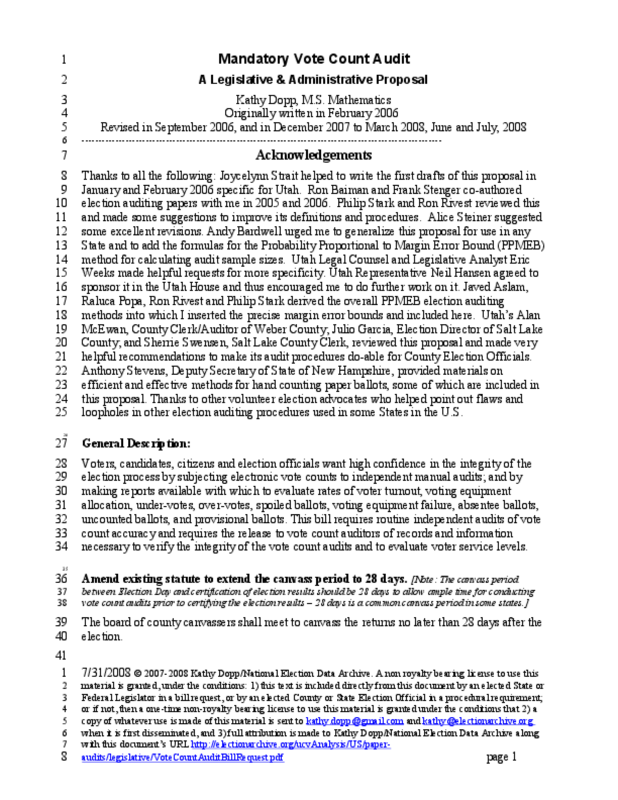 Voters, candidates, citizens and election officials want high confidence in the integrity of the election process by subjecting electronic vote counts to independent manual audits; and by making reports available with which to evaluate rates of voter turnout, voting equipment allocation, under-votes, over-votes, spoiled ballots, voting equipment failure, absentee ballots, uncounted ballots, and provisional ballots. This bill requires routine independent audits of vote count accuracy and requires the release to vote count auditors of records and information necessary to verify the integrity of the vote count audits and to evaluate voter service levels. Copyright 2006 National Election Data Archive. All rights reserved.